Joom Beams much anticipated Gen 2 Mini Gym Combo includes upgraded kip bar with numbered marking for easier adjustments, rectangular legs for increased surface area contact with the floor, pre-sunken holes for fastening the horizontal bar kit to the floor (bolts included). Also includes tool-less quick release middle leg on the balance beam for quick and easy stow and storage. Adjustable Horizontal Kip Bar to 36, 42, 48, 54, 60″ with ultra-secure lock down Stainless screw bolts. Gen 2 model with thicker rectangular tubing, marked adjustments, pre-sunk holes for attaching to the floor. Joom Beem’s Gen 2 complete gymnastics set to be released for Summer of 2018. 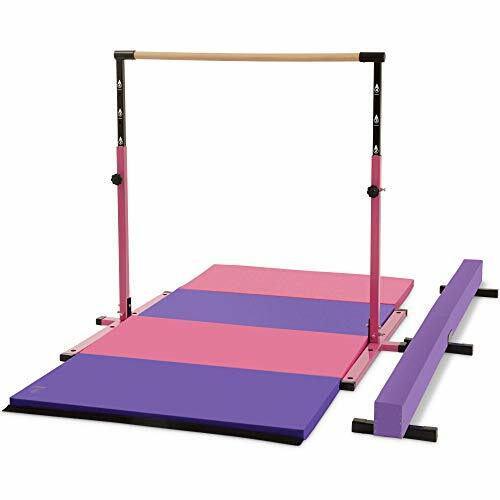 With the famous Pink and Purple Balance Beam, Horizontal Bar and Mat, your little gymnast will have it all. We have incorporated several upgrades from the previous generation, including rectangular shaped legs to give more surface area thus more support and contact to the floor, results in an increased stability. Labeled marks to easily adjust the height and to clearly see that each side is equivalent in height when adjusting. Quick release middle leg on the Folding Balance Beam so you don’t need to use any tools to quickly fold and stow for storage or transport. We have designed sunken bolt holes (bolts included) designed for standard flooring. 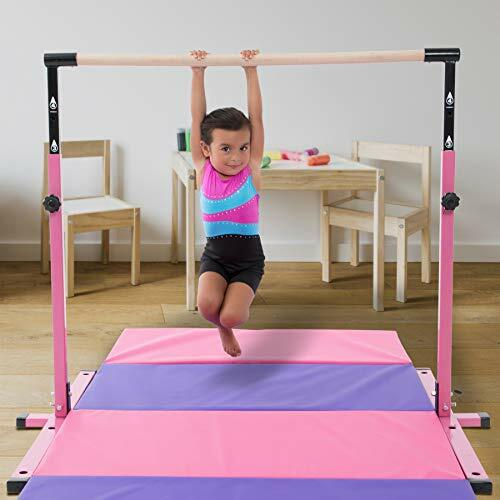 Joom Beem now makes it possible to have your very own equipped gymnastics mini-facility right in your own home. The low balance beam is 8 feet long, 4 inches wide, and 6 inches tall. It is constructed from a lightweight wood composite material. With its breakthrough folding beam design, it can easily be folded in half on its flat, durable stainless steel hinge for easy storage and mobility. 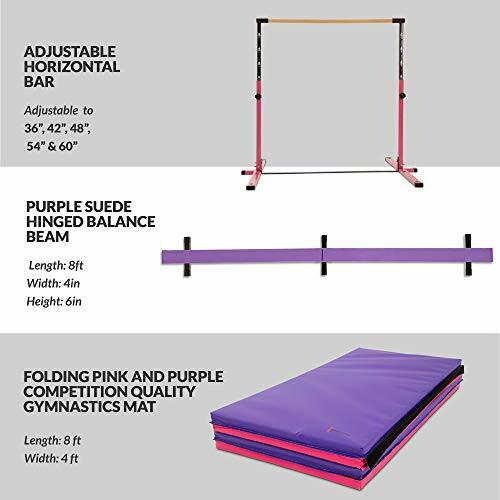 The low beam features a 3/8-inch thick durable foam padding on the top and it is wrapped around with beautiful tactile Purple Suede, with its three strategically placed braces at each end and in the middle gives the Beam full support and stability. The Adjustable Horizontal Bar can be adjusted to 36, 42, 48, 54, or 60 inches. 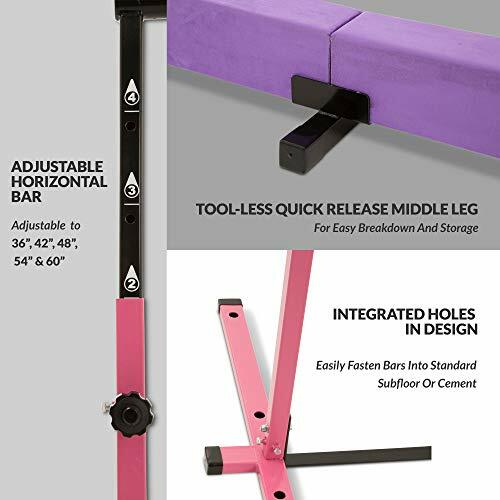 Made from solid steel for durability and a beautiful Pink Oxide coating, this high quality Horizontal Bar is made to last a lifetime. 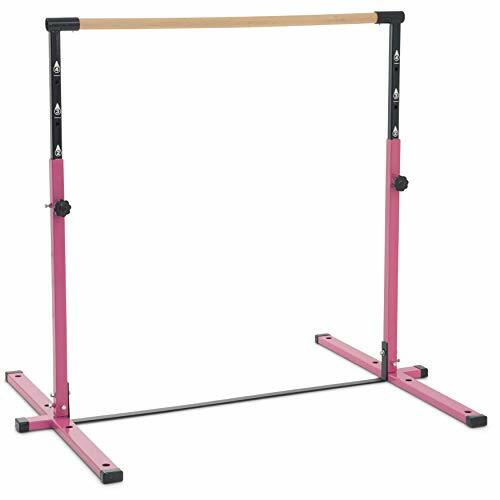 Now for advance Gymnasts we have additional stabilization Bar for sale separately. 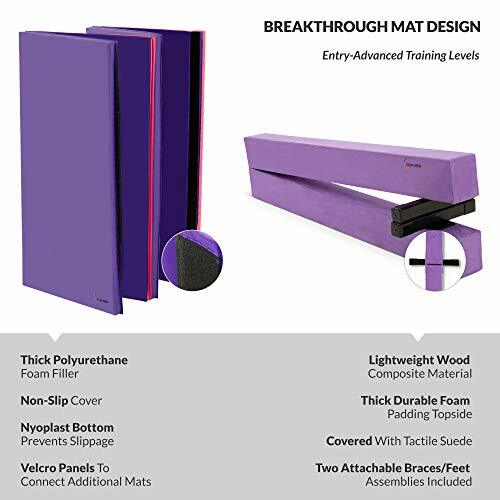 The premium folding mat can be used for entry level to advanced gymnastics training. With its 1 3/8″ thick polyurethane foam filler, 18-ounce vinyl over nylon non-slip cover that is also fire-retardant, puncture and mildew resistant. The Mat features Velcro panels on each to connect additional mats for more tumbling fun.